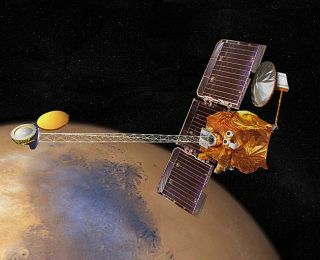 NASA's oldest Mars orbiter Odyssey has entered a safe modethat has stalled its science observations. But mission controllers think theyhave identified the cause and plan to revive the spacecraft soon.. Engineers diagnosed the cause of the Saturday event as the 8-year-oldspacecraft's proper response to a memory error. The likely cause is an upset inthe orbiter's memory error external bus, the same thing that caused asimilar glitch in June 2008. Odyssey has been orbiting Mars since 2001. "This event is a type we have seen before, so we have aknown and tested path to resuming normal operations," said Odyssey project manager Philip Varghese atNASA's Jet Propulsion Laboratory in Pasadena, Calif., in an update. Odyssey's fellow Mars-orbiting spacecraft, the MarsReconnaissance Orbiter, is also currentlyin a safe mode, though it has been stuck like that since August. While Odyssey was in safe mode over the weekend, it remainedin communication with ground controllers and maintained healthy temperaturesand power. To clear the memory error, the team commanded Odyssey toperform a cold reboot of the orbiter's onboard computer on Monday. Thespacecraft reported that the reboot had been completed successfully, missionmanagers said. In addition to Odyssey's own major scientific discoveriesand continuing studies of the planet, the spacecraft has played important rolesin supporting the missions of the Mars rovers Spirit and Opportunity and thePhoenix Mars Lander. Until Odyssey is available again as a communications relay,Spirit and Opportunity will be operating with direct communications to and fromEarth. Video Show - What Went Wrong on Mars?